After his third place on the previous day, Luis León Sánchez (Rabobank) sprinted to victory in the third stage of the Tour de Romandie, between La Neuveville and Charmey; putting himself within one second of the race lead. The Spanish rider was the fastest of a diminishing peloton at the end of the tough, uncategorised climb to the finish of the hilly 157.6km stage, as the overall contenders for the race fought it out once more. Gianni Meersman (Lotto-Belisol) also improved two places on the previous day’s result, as he took a close second behind Sánchez. The Belgian raised his arm in protest as he crossed the line, claiming that the Spanish rider had closed the gap to the barriers a little, but the sprint was judged to be clean. Amstel Gold winner Paolo Tiralongo (Astana) matched his result of stage one, with third place. Ten seconds bonus on the line meant that Sánchez moved to within a single second of race leader Bradley Wiggins (Team Sky), who crossed the line safely in the peloton behind the fight for stage victory. “Even after that tough luck in the first stage when I couldn’t join in the sprint because of a broken spoke, the team kept on working for me,” said Sánchez afterwards. “Today everything worked out well. The stage was characterised by a five-man breakaway from Matt Brammeier (Omega Pharma-Quick Step), Gatis Smukulis (Katusha), Leigh Howard (GreenEdge), Tosh Van der Sande (Lotto-Belisol), and Anders Lund (Saxo Bank), who escaped almost as soon as it had begun. Howard was best placed overall, at 3’43” behind Wiggins, and was virtual race leader for some time, as the group’s lead grew to 5’50” in the middle of the stage. Team Sky, along with Lampre-ISD, Garmin-Barracuda and Rabobank steadily closed it down though; although Smukulis made a solo bid for glory, the race was back together as the Latvian struggled up the final climb with less than five kilometres to go. There were several attacks in the closing kilometres, notably from eighth placed Dave Zabriskie (Garmin-Barracuda), Simon Spilak (Katusha) and Roman Kreuziger (Astana), and the Janez Brajkovic (Astana), but these were all closed down by Team Sky and Rabobank, who set up Sánchez to take his third victory of the season. Brammeier, Smukulis, Howard, Van der Sande and Lund escaped after just ten kilometres and, after 45km were 4’40” ahead, putting the Australian in the virtual race lead. The lead rose to 5’06” as they began the 3rd category climb to Arrisoules, but over the top after 59.9km it was back down to 4’36”. Over the rolling kilometres that followed the gap was to rise again, where it reached its maximum of 5’50” after 100km. On the 2nd category climb to Le Chatelard it began to drop but, as the peloton reached the lower slopes, there was an attack from Andriy Grivko (Astana) et Matthew Lloyd (Lampre-ISD). The two counterattackers were pursued by Cyril Gautier (Europcar) and at the summit, after 102.8km the peloton was 4’27” behind the five leaders, with the three-man ‘chasse patate’ thirty seconds ahead. With 40km to go the gap was down to four minutes and, with Lloyd back in the peloton, Lampre-ISD came to the aid of Team Sky at the head of the peloton. The lead began to go out again, although Gautier and Grivko were picked up with 37km to go. Europcar and Rabobank took over at the front with 34km to go, but the gap was still almost four minutes to the five-man break. On the 3rd category climb to Treyvaux, with 33km to go, it had come down a little, but at 30km to go it was still 3’33” so Lampre-ISD, then Team Sky took over on the front once more. Howard was still in virtual yellow, but this was to change over the next few kilometres. Rabobank and Garmin-Barracuda came to help Team Sky at the front, stringing out the peloton on the flat valley roads, and the gap to the leaders began to tumble. With 20km to go it was still 2’41” however, meaning that the men in front still had a chance of staying away. At the intermediate sprint in Bulle, with 17.8km to go, the quintet was little more than two minutes clear, so Smukulis decided to leave the rest behind and go it alone. Behind, in the peloton, Kevin Dehaes (Lotto-Belisol) came down in the middle of the road as he hit a low signpost in the middle of the road. Luckily, he was near the back of the peloton, and nobody else came down, but the Belgian took some time to get up. Two Rabobank riders, and two from Garmin-Barracuda, were pulling the peloton into one long string but, with 10km to go, Smukulis still led by 1’46”. The other four riders were just 18 seconds behind the Latvian, as Brammeier set off in pursuit, with Van Der Sande in tow; Howard and Lund chased back up to them, but Brammeier kicked again. The Irish champion was bearing down on Smukulis as the final climb began with 8km to go, but the other three caught up and passed him on the early slopes. The Katusha rider was in sight on the straight road, but was still climbing strongly, and the final gap was proving difficult to close. With 7km to go, with the gap down to little over a minute, Saur-Sojasun took over on the front and began to bear down on the four chasers; streaking past them with 5.5km to go. Smukulis was still 16 seconds up ahead but, with five kilometres to go Dave Zabriskie (Garmin-Barracuda) broke free in pursuit. The American was not to stay away for long however, as Richie Porte led the Team Sky train past him, catching Smukulis with 4.4km to go. Fabrice Jeandesboz (Saur-Sojasun) was the next to go, having been aggressive in the hills in previous days, but his attack was quickly overcome but one with 3km to go from Roman Kreuziger (Astana) and Simon Spilak (Katusha), who managed to escape. As it had done on previous days though, Team Sky calmly pulled them back, but as they were caught with two kilometres to go Janez Brajkovic (Astana) jumped away. The Slovenian’s move was only to last a few hundred metres, with Team Sky and Rabobank pulling him back. The two teams were keeping the pace high, confounding a final kilometre attack from Johnny Hoogerland (Vacansoleil-DCM). 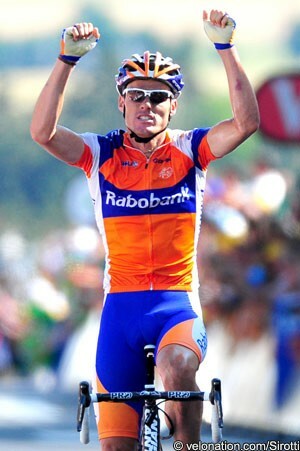 Rabobank took over into the finishing straight, launching Sánchez towards the line; the Rabobank rider appeared to lean on Meersman a little, close to the right hand barrier, and the Belgian put out his hand in protest as the Spanish rider sat up to celebrate. Click on the arrows at the top of the column to sort the race results. BEL 2 Gianni Meersman (Lotto - Belisol Team) s.t. ITA 3 Paolo Tiralongo (Astana Pro Team) s.t. USA 4 Andrew Talansky (Garmin - Barracuda) s.t. NED 5 Bauke Mollema (Rabobank Cycling Team) s.t. ITA 6 Rinaldo Nocentini (Ag2R - La Mondiale) s.t. POL 7 Maciej Paterski (Liquigas - Cannondale) s.t. ITA 8 Giampaolo Caruso (Katusha Team) s.t. ESP 9 Gorka Verdugo Marcotegui (Euskaltel - Euskadi) s.t. FRA 10 Fabrice Jeandesboz (Saur - Sojasun) s.t. ITA 11 Daniele Pietropolli (Lampre - ISD) s.t. USA 12 Tejay Van Garderen (BMC Racing Team) s.t. SUI 13 Steve Morabito (BMC Racing Team) s.t. FRA 14 Pierre Rolland (Europcar) s.t. ITA 15 Manuele Mori (Lampre - ISD) s.t. CZE 16 Roman Kreuziger (Astana Pro Team) s.t. AUT 17 Thomas Rohregger (RadioShack - Nissan) s.t. BEL 18 Serge Pauwels (Omega Pharma - Quickstep) s.t. NED 19 Wilco Kelderman (Rabobank Cycling Team) s.t. ITA 20 Dario Cataldo (Omega Pharma - Quickstep) s.t. ESP 21 Jonathan Nicolas Castroviejo (Movistar Team) s.t. GBR 22 Bradley Wiggins (Sky Procycling) s.t. POR 23 Tiago Machado (RadioShack - Nissan) s.t. FRA 24 Maxime Mederel (Saur - Sojasun) s.t. NED 25 Tom Jelte Slagter (Rabobank Cycling Team) s.t. POR 26 Rui Alberto Faria Da Costa (Movistar Team) s.t. AUS 27 Richie Porte (Sky Procycling) s.t. ESP 28 Ruben Plaza Molina (Movistar Team) s.t. IRL 29 Daniel Martin (Garmin - Barracuda) s.t. FRA 30 Guillaume Levarlet (Saur - Sojasun) s.t. AUS 31 Michael Rogers (Sky Procycling) s.t. ESP 32 Daniel Navarro Garcia (Team Saxo Bank) s.t. RUS 33 Eduard Vorganov (Katusha Team) s.t. SLO 34 Janez Brajkovic (Astana Pro Team) s.t. RUS 35 Vladimir Karpets (Movistar Team) s.t. DEN 36 Chris Anker Sorensen (Team Saxo Bank) s.t. FRA 37 Jérome Coppel (Saur - Sojasun) s.t. AUS 38 Cadel Evans (BMC Racing Team) s.t. USA 39 Peter Stetina (Garmin - Barracuda) s.t. BLR 40 Branislau Samoilau (Movistar Team) s.t. NED 41 Johnny Hoogerland (Vacansoleil - DCM Pro Cycling Team) s.t. ESP 42 Mikel Astarloza (Euskaltel - Euskadi) s.t. ESP 43 Juan Jose Cobo Acebo (Movistar Team) s.t. ESP 44 Egoi Martinez De Esteban (Euskaltel - Euskadi) s.t. RUS 45 Petr Ignatenko (Katusha Team) s.t. NED 46 Stef Clement (Rabobank Cycling Team) s.t. POL 47 Sylvester Szmyd (Liquigas - Cannondale) s.t. NED 48 Laurens Ten Dam (Rabobank Cycling Team) s.t. ITA 49 Marco Marzano (Lampre - ISD) s.t. FRA 50 John Gadret (Ag2R - La Mondiale) s.t. CAN 51 Ryder Hesjedal (Garmin - Barracuda) s.t. NED 52 Pieter Weening (GreenEdge Cycling Team) s.t. NZL 53 George Bennett (RadioShack - Nissan) s.t. BLR 54 Kanstantsin Siutsou (Sky Procycling) s.t. GER 55 Andréas Klöden (RadioShack - Nissan) s.t. FRA 56 Thibaut Pinot (Equipe Cycliste FDJ - BigMat) s.t. USA 57 Christian Vande Velde (Garmin - Barracuda) s.t. FRA 58 Kenny Elissonde (Equipe Cycliste FDJ - BigMat) s.t. SLO 59 Simon Spilak (Katusha Team) s.t. ESP 60 Jorge Azanza Soto (Euskaltel - Euskadi) s.t. FRA 61 Arthur Vichot (Equipe Cycliste FDJ - BigMat) s.t. ITA 62 Ivan Basso (Liquigas - Cannondale) s.t. ESP 63 Jesús Hernández Blazquez (Team Saxo Bank) s.t. UKR 64 Volodymyr Gustov (Team Saxo Bank) s.t. ESP 65 Mikel Landa Meana (Euskaltel - Euskadi) s.t. USA 66 David Zabriskie (Garmin - Barracuda) s.t. BLR 67 Vasil Kiryienka (Movistar Team) s.t. RUS 68 Pavel Brutt (Katusha Team) s.t. FRA 69 Amaël Moinard (BMC Racing Team) s.t. ESP 70 Angel Ruiz Madrazo (Movistar Team) s.t. KAZ 71 Andrey Kashechkin (Astana Pro Team) s.t. SUI 72 Johann Tschopp (BMC Racing Team) s.t. BEL 73 Kevin Seeldraeyers (Astana Pro Team) s.t. BEL 74 Thomas De Gendt (Vacansoleil - DCM Pro Cycling Team) s.t. COL 76 Jose Cayetano Sarmiento Tunarrosa (Liquigas - Cannondale) s.t. ITA 77 Mirko Selvaggi (Vacansoleil - DCM Pro Cycling Team) s.t. NED 78 Rob Ruijgh (Vacansoleil - DCM Pro Cycling Team) s.t. FRA 79 Mathieu Perget (Ag2R - La Mondiale) s.t. FRA 80 Angelo Tulik (Europcar) s.t. FRA 81 Cyril Gautier (Europcar) s.t. JPN 83 Fumiyuki Beppu (GreenEdge Cycling Team) s.t. FRA 84 Cédric Pineau (Equipe Cycliste FDJ - BigMat) s.t. FRA 88 Jérémy Roy (Equipe Cycliste FDJ - BigMat) s.t. FIN 89 Jussi Veikkanen (Equipe Cycliste FDJ - BigMat) s.t. BEL 90 Klaas Lodewyck (BMC Racing Team) s.t. SWE 91 Fredrik Kessiakoff (Astana Pro Team) s.t. UKR 92 Andriy Grivko (Astana Pro Team) s.t. NED 93 Martijn Keizer (Vacansoleil - DCM Pro Cycling Team) s.t. SWE 94 Gustav Erik Larsson (Vacansoleil - DCM Pro Cycling Team) s.t. ESP 95 Joan Horrach Rippoll (Katusha Team) s.t. FRA 96 Julien Berard (Ag2R - La Mondiale) s.t. SUI 97 Oliver Zaugg (RadioShack - Nissan) s.t. SUI 98 Martin Kohler (BMC Racing Team) s.t. USA 99 Brent Bookwalter (BMC Racing Team) s.t. AUS 100 Luke Durbridge (GreenEdge Cycling Team) s.t. AUS 101 David Tanner (Team Saxo Bank) s.t. ESP 102 Ricardo Garcia Ambroa (Euskaltel - Euskadi) s.t. FRA 103 Romain Sicard (Euskaltel - Euskadi) s.t. ITA 105 Cristiano Salerno (Liquigas - Cannondale) s.t. POL 107 Maciej Bodnar (Liquigas - Cannondale) s.t. ITA 108 Manuele Boaro (Team Saxo Bank) s.t. ITA 109 Giacomo Nizzolo (RadioShack - Nissan) s.t. SVK 110 Martin Velits (Omega Pharma - Quickstep) s.t. DEN 111 Lars Ytting Bak (Lotto - Belisol Team) s.t. BEL 112 Gert Dockx (Lotto - Belisol Team) s.t. BEL 113 Frederik Willems (Lotto - Belisol Team) s.t. BEL 114 Tosh Van Der Sande (Lotto - Belisol Team) s.t. FRA 115 Giovanni Bernaudeau (Europcar) s.t. ITA 116 Fabio Sabatini (Liquigas - Cannondale) s.t. POR 117 Nelson Oliveira (RadioShack - Nissan) s.t. POR 118 Sergio Miguel Moreira Paulinho (Team Saxo Bank) s.t. ITA 119 Paolo Longho Borghini (Liquigas - Cannondale) s.t. SUI 120 Martin Elmiger (Ag2R - La Mondiale) s.t. GER 121 Bert Grabsch (Omega Pharma - Quickstep) s.t. BEL 122 Maarten Neyens (Lotto - Belisol Team) s.t. BEL 123 Kristof Vandewalle (Omega Pharma - Quickstep) s.t. FRA 124 Jonathan Hivert (Saur - Sojasun) s.t. FRA 125 Jean-marc Marino (Saur - Sojasun) s.t. IRL 126 Matthew Brammeier (Omega Pharma - Quickstep) s.t. FRA 127 Yannick Talabardon (Saur - Sojasun) s.t. FRA 128 Jimmy Engoulvent (Saur - Sojasun) s.t. FRA 129 Kevin Reza (Europcar) s.t. ITA 130 Davide Malacarne (Europcar) s.t. FRA 131 Franck Bouyer (Europcar) s.t. FRA 132 Jean-christophe Peraud (Ag2R - La Mondiale) s.t. RSA 133 Daryl Impey (GreenEdge Cycling Team) s.t. DEN 134 Anders Lund (Team Saxo Bank) s.t. AUS 137 Michael Matthews (Rabobank Cycling Team) s.t. LTU 138 Ramunas Navardauskas (Garmin - Barracuda) s.t. GER 139 Danilo Hondo (Lampre - ISD) s.t. ITA 140 Morris Possoni (Lampre - ISD) s.t. AUS 141 Matthew Lloyd (Lampre - ISD) s.t. ITA 142 Davide Cimolai (Lampre - ISD) s.t. FRA 143 Saïd Haddou (Europcar) s.t. FRA 144 Rémi Pauriol (Equipe Cycliste FDJ - BigMat) s.t. DEN 145 Alex Rasmussen (Garmin - Barracuda) s.t. ESP 146 Alan Lezaun Perez (Euskaltel - Euskadi) s.t. CAN 147 Christian Meier (GreenEdge Cycling Team) s.t. USA 149 Danny Pate (Sky Procycling) s.t. GBR 151 Mark Cavendish (Sky Procycling) s.t. NED 5 Stef Clement (Rabobank Cycling Team) s.t. NED 7 Wilco Kelderman (Rabobank Cycling Team) s.t. SLO 9 Simon Spilak (Katusha Team) s.t. ESP 10 Ruben Plaza Molina (Movistar Team) s.t. POR 12 Tiago Machado (RadioShack - Nissan) s.t. ESP 14 Jonathan Nicolas Castroviejo (Movistar Team) s.t. NED 16 Tom Jelte Slagter (Rabobank Cycling Team) s.t. USA 17 Tejay Van Garderen (BMC Racing Team) s.t. AUT 19 Thomas Rohregger (RadioShack - Nissan) s.t. ESP 20 Daniel Navarro Garcia (Team Saxo Bank) s.t. GER 22 Andréas Klöden (RadioShack - Nissan) s.t. BLR 23 Branislau Samoilau (Movistar Team) s.t. CAN 24 Ryder Hesjedal (Garmin - Barracuda) s.t. USA 26 Peter Stetina (Garmin - Barracuda) s.t. CZE 27 Roman Kreuziger (Astana Pro Team) s.t. SLO 28 Janez Brajkovic (Astana Pro Team) s.t. ITA 30 Paolo Tiralongo (Astana Pro Team) s.t. POL 32 Sylvester Szmyd (Liquigas - Cannondale) s.t. ESP 33 Angel Ruiz Madrazo (Movistar Team) s.t. NED 34 Laurens Ten Dam (Rabobank Cycling Team) s.t. FRA 36 Fabrice Jeandesboz (Saur - Sojasun) s.t. BEL 37 Gianni Meersman (Lotto - Belisol Team) s.t. IRL 39 Daniel Martin (Garmin - Barracuda) s.t. FRA 40 Maxime Mederel (Saur - Sojasun) s.t. ITA 42 Rinaldo Nocentini (Ag2R - La Mondiale) s.t. FRA 43 Amaël Moinard (BMC Racing Team) s.t. ESP 45 Gorka Verdugo Marcotegui (Euskaltel - Euskadi) s.t. FRA 46 Pierre Rolland (Europcar) s.t. ITA 47 Daniele Pietropolli (Lampre - ISD) s.t. DEN 50 Chris Anker Sorensen (Team Saxo Bank) s.t. AUS 52 Richie Porte (Sky Procycling) s.t. ESP 55 Egoi Martinez De Esteban (Euskaltel - Euskadi) s.t. NED 58 Johnny Hoogerland (Vacansoleil - DCM Pro Cycling Team) s.t. ESP 65 Juan Jose Cobo Acebo (Movistar Team) s.t. AUS 69 Allan Davis (GreenEdge Cycling Team) s.t. KAZ 84 Andrey Kashechkin (Astana Pro Team) s.t. FRA 87 Jonathan Hivert (Saur - Sojasun) s.t. FRA 91 Jean-christophe Peraud (Ag2R - La Mondiale) s.t. ITA 116 Paolo Longho Borghini (Liquigas - Cannondale) s.t. BEL 149 Kenny Dehaes (Lotto - Belisol Team) s.t.